Our secure shopping cart accepts multi-currency, major credit cards, PayPal. We ship priority mail. OUR FOCUS: Health & weight conscious consumers. OUR TEAS: Fresh organic, white & green tea from fine estates globally. OUR SPECIALTY: Lab tested, certified, Highest Antioxidant teas. Character: Surprising body and a captivating taste that has an intriguing hint of oakiness. Contains ultra high antioxidant level vs 5-6% for mass-market teas. The mellow, approachable character of this tea is enhanced by its notes of sweet meadow flowers and toasty maize. Shincha is a very special first of the first crop, young bud sencha. This shincha is grown in Kagoshima Prefecture, one of Japan's premier tea growing regions where the rich volcanic soil produces incredible teas. The shincha leaves are hand picked and hand rolled into long and extremely fine needles. This tea has a soft taste like fresh spring green tea. The aroma is noticeably sweet and reminds one of wild orchid. Shincha's key characteristic is its refreshing and invigorating scent of new leaves. Another feature of shincha is it's less bitter/astringent taste. Shincha has a higher content of amino acids (L-Theanine) and vitamin C, giving it full-bodied flavor and sweetness. L-theanine is linked to increased alpha brain wave production and is considered a natural antidepressant and stress reliever. Japanese studies link consumption of L-theanine with strengthening the immune system. L-theanine is often added to energy drinks and is known to give a 6-hour sustainable energy boost. Produced under ISO 14001 Certified Environmental Management Standards. Produced under ISO 14001 Certified Environmental Management Standards. 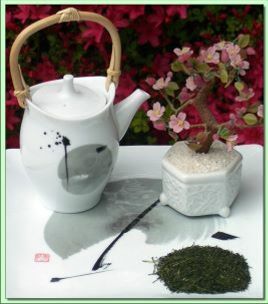 We offer the latest comprehensive green tea research on catechin, EGCG and other topics FREE in our health section we do not make any product weight loss or health claims, but rather present peer reviewed clinical research on these issues related to green and white tea so you can make your own informed decisions. Some images and site information courtesy of ITO EN, Inc.